Does this Apple recruitment video show off the next Apple iPhone? A self-promotion recruiting video by Apple is a video self-pat on the back by the Cupertino based tech titan as some of the company's employees explain that to work at Apple you have to be the top in your field, or have the potential to reach that point. One employee says that no company has the reverence for expertise that Apple has. Another goes on about how at Apple the small teams come to work with the notion that they are doing something great, and thus, something great happens. Things can't be just good enough, according to one Apple employee, who says that things have to be the best. Is this the next iteration of the Apple iPhone? Some of the stories passed along talk about how Apple had to start over to develop smaller mobile batteries that last longer. Another story focuses on how the magnetic Smart Cover for the Apple iPad 2 became a challenge for Apple engineers. According to the video, one member of the team became an expert on running computer simulations involving magnetic fields. But the actual reason we are showing you this video has nothing to do with working at Apple. It has to do with some viewers of the video who say they see a mock-up of the next iteration of the Apple iPhone with a larger screen. 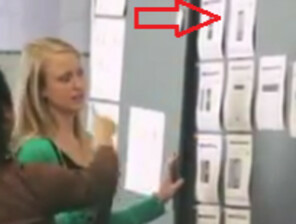 It happens at about the 1 minute mark when the video shows a number of product sheets on a wall. It really isn't a clear shot and frankly, we wouldn't bet on it either way. Why can't we just have the annual dropped prototype in the bar routine? Actually, if Apple wanted to mess with everyone's mind, they'd have someone drop a handset in a bar that in no way resembles the next iteration of the Apple iPhone just to throw everyone off. Getting back to the that product sheet allegedly belongs to the next iPhone, can anyone actually make out enough detail to say if that is a picture of the sixth generation Apple iPhone on the wall? dont use that bad word! i agree android is better but i hate when people say that word to describe something stupid. How are you so certain that he was describing it as stupid? He could have been saying "Happyyyyyyyyy" It is you that took it into context in your own mind and translated gay into stupid. my own mind? any logic human would know he wasn't referring to happy. Not all human logic is negative. Cup being half full or half empty situation. Not down voting you because I'm an apple fanboy but because you're a tool For... Life. that's definitely the next iPhone guys, i'm getting really pumped right now and i can't wait to give the first person that can get me one of these my money. just sayin'! And u said all that to say what exactly? Only Motorola android devices get great batt life. Samsungs is good not great. My lte iPad lasts 3-4 days of regular usage on a single charge. Of cause of cause...Oh, Did I forget to mention? My SGS3 last a week of regular usage on a single charge! Forget him. I don't think he has actually seen the new screen of the new iPad and the graphics and the amount of processing that that takes. I didn't even get the point of when they were talking about the battery being smaller. Because that part was about the new Macbook, but ok. I just love how they can come up with this brilliant videos.. I can't deny that Apple has the best marketing team in the world. They can turn s**tty products into one of the world's hottest products.. They indeed have the best marketing team, and patent lawyers..
and still being made in china not u.s.
Meh. Given the obsession with security (even post-Steve), I doubt anything is leaking. More like engineering drawings of past products that didn't see the light of day. I wonder if they told the the guy who cleans the floors in Apple HQ that he was the top of his field too. didnt believe anything that they said, apple only sues everyone, that what they do. I'm wondering, why would anyone even CARE? Meh!